In 1935 the rivalry and bitterness between England’s two university towns, Oxford and Cambridge had reached such a pitch, that physical attacks were being made on each other. So a halt to bitterness had to be called. A spot, equidistant between the two university towns was found, it was the village green at Sherington. 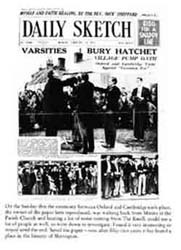 On Sunday February 24th 1935, just before midday, representatives from the two universities met on Sherington’s Knoll, by the village pump. A Latin prayer was read, then the four editors from the respective university magazines, namely ‘Isis’, ‘Cherwell’, ‘Greensman’ and ‘Grouta’ read a speech. 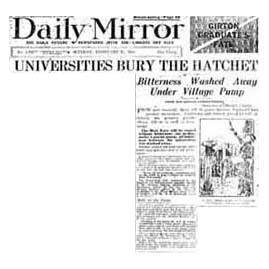 A dove of peace was released and water from the pump was washed over the university papers - to wash away the bitterness and to unite against the new "Red Brick" universities. On the 25th February 1995 a re-enactment of the original ceremony was held and the two universities were invited to re-affirm their vows of non-bitterness, on Sherington's Knoll. But this time they were much more gracious and included all of the universities old and new together. This they did in front of an audience of Sherington villagers and local dignitaries, including the Mayor or Milton Keynes and the local MP at the time, Mr Edward Ellis and Mr Peter Butler respectively, also not forgetting the current chairman of Sherington Parish Council, Ian Thompson. After the pump has washed away the bitterness of times passed, the Dove was offered to Mr Phil Smith, who is reputed to have remarked something like "This is not a dove, it's a blooming pigeon"....This we have to confirm. The event was rounded off with a Copper Beech tree planted in the play area next to the Village Hall. This place was chosen as it had been decided that The Knoll needed a thinning down of trees, not another planting. For those who wanted to carry on with the festivities, the honoured guests and paying public were treated to "Hatchet Pie" at The Swan. Further archive photos can be found below - click on the photo for a full size version.